There is nothing better than sitting down to a roast dinner on a Sunday. A roast dinner that someone else has cooked, with close friends, sharing a great bottle of wine, at a pub. This happened to me a couple of weeks ago, on a perfect autumn day, where the sun was shining and there was a slight crispness in the air. It had been quite some time since I had sat down to a roast dinner . While I can cook, and cook a roast quite well, I’m not known to be one to cook myself a roast dinner and polish off a whole chicken or leg of lamb in one sitting. I am however, fascinated by those who can; how can one human being stomach that much meat in one go? Any who, getting back to my perfect Sunday lunch. The pub of choice was The Grace Darling Hotel. A much-loved watering-hole nestled in trendy Collingwood that serves up roast dinner each and every Sunday; the ‘Sunday Roast Today’ was lamb. Yum! This made my meal ordering quite easy. The next part came the “I’d like to see the wine menu please”. Since my vino girlfriends and I were each going to have a glass of red, we decided to share a bottle. Scanning through the menu, the girls decided to task me with job of choosing a wine that would match perfectly. While the idea of choosing a red might be easy for some, the pressure of getting the right match with food can be quite hard, as it can make or break the wine and/or the food. On the menu, there was the choice of a Shiraz, Pinot Noir, Cabernet Sauvignon, Sangiovese and a Nebbiolo, with tasting notes listed beside each. Trying to gauge the taste of each wine from reading the descriptions, it was the Nebbiolo that stood out at me. The tasting notes it had listed included violets, wild mushrooms and rose petals. Mmm who doesn’t love flowers with a lamb roast? Aside from the bouquet of flowers, it was the mushroom note that had me hooked. Yes I am a lover of mushrooms. The food kind, not the ‘other’. Nebbiolo, pronounced “Neb-ee-yolo”, or as I would say “YOLO wine”, is a dry Italian red, likened to a Pinot Noir but with more body. 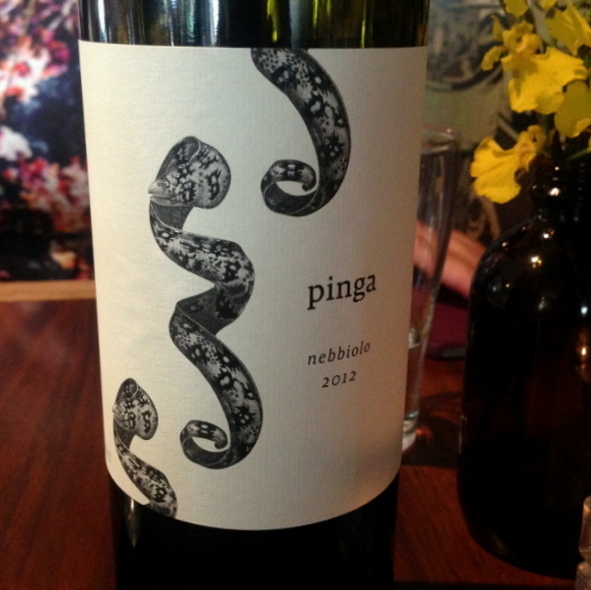 This Nebbiolo was named Pinga, and was a 2012 vintage that hailed from Pondalowie Vineyards, Toolleen within the Heathcote region – a wine region in Victoria Australia renowned for its reds. While we waited for our roast to arrive, we decided to pop the cap and get started. Needless to say, without the roast, this wine was a delight to drink. WITH the roast, it was even better. We polished off the meal and bottle quite easily, and it became clear to us all that the Nebbiolo was the perfect choice. I now think that the nursery rhyme ‘Mary had a little lamb’ should be re-written to ‘Mary had a little lamb and a bottle of Nebbiolo’. Shame Sunday’s only happen once a week. How about you? What’s your choice of wine you like to pair with your Sunday roast ? Feel free to post your comments in the section below. Matching wine with chocolate. Who said it couldn’t be done? Easter. A day that chocoholics can bask in by eating limitless chocolate, and not be judged. Seeing as though every day is a vino day, what does one do when trying to pair them together at Easter? According to some people, apparently it’s quite hard to do. ‘Apparently’. When you read the descriptions of wines, there are a lot that state that they have a dark chocolate tasting note. So why can’t a wine with a chocolate tasting note not be matched with a chocolate? I’m not sure of the science behind this, as to why this is the case, but what I can tell you are three little words that will prove these ‘people’ wrong; Nigella Lawson and Port. Okay so technically that’s four words. But who’s counting. You’re currently nursing a sugar overdose. So let’s start with the first part, getting the chocolate right. I’m sure any chocolate would do, but to ramp it up a bit, I decided to match my wine with a Nigella Lawson dish. I first saw her make this dish on a Christmas special, and was in love with the idea. A chocolate salame. That’s right. 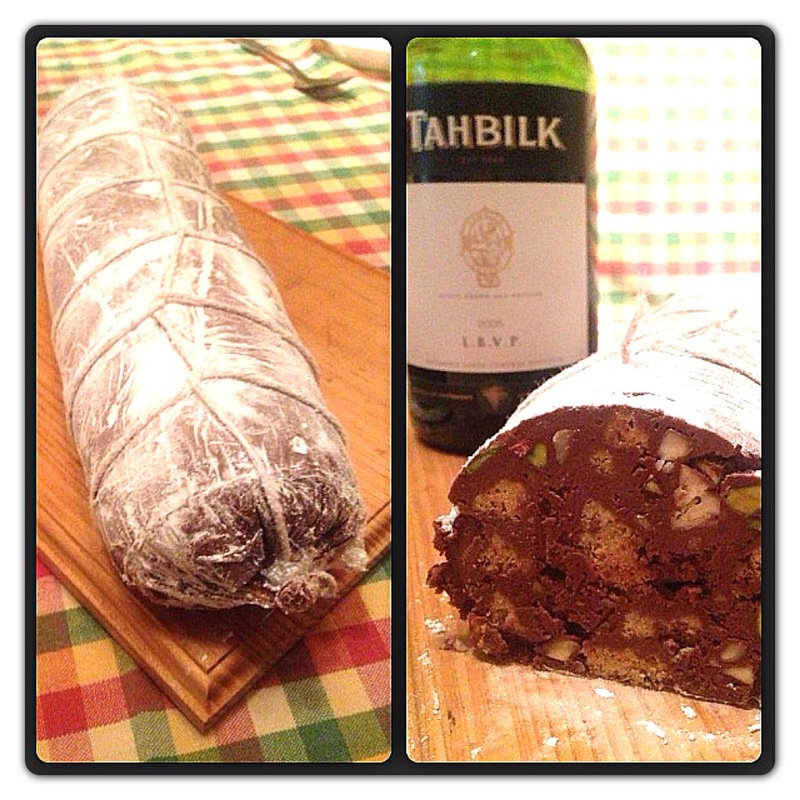 It looks like salami, it sounds like salami, but as the name suggests, it’s a chocolate salame. Filled with a selection of nuts, chocolate and biscuit, it’s the perfect combination for an after dinner treat. Wow. Even from reading that, it sounds like a chocolate salame in a bottle. Sure enough, serving the salame along side the L.B.V.P proved to be a hit all around. With a small bite of the chocolate salame, followed by a sip of the port, it really brought out the sweetness and berriness of the port. Whoever said matching wine with chocolate is hard to do, must not be a chocolate lover. For all you chocolate lovers out there, I can tell you, it can be done. It can be done with a little help from Nigella Lawson and a tasty port. Following weeks of training, I finally arrived in Bordeaux. The city of Bordeaux is an amazing city, oozing French charm, with beautiful architecture and urban streetscape. For those of you playing at home, Bordeaux is located in the South West of France, and is considered to be one of the world’s wine capitals. With over 286,000 acres of vineyards, there’s certainly no shortage of wine; Please pass me the bottle. 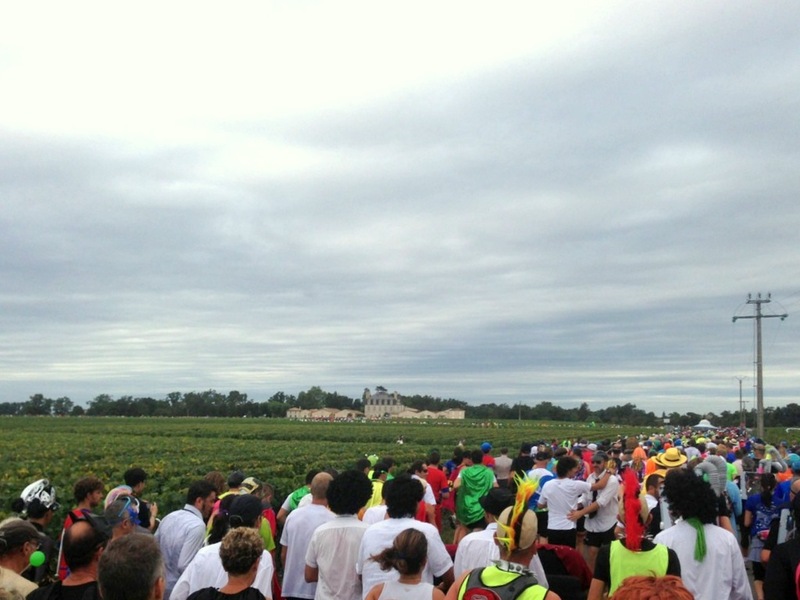 While we were staying in the city of Bordeaux, the run itself was held out in Pauillac (pronounced ‘Poy Yak’), which is just over an hours drive from Bordeaux in the Medoc region. The night before the run I was mixed with emotion. Emotions of excitement, nervousness and a slight sense of ‘what the hell have I signed myself up for’? With my belly full of carbs, I was out like a light. Early morning rise, off we headed to the train station in our fancy dress costumes to catch the local train to Pauillac, complete with superman and several storm troopers on board. Ready at the start line, the party atmosphere was brewing. The effort people went to with their outfits was impressive – Aliens that really did look like they were from outta space, Avatar, Star trek, Princess Leia’s, and even a Chewbacca. Music blasting out of speakers, French women suspended by massive balloons, and dancing all around, it was hard to believe we were about to run a marathon. The start gun sounded. We were off. As we ran through every single one of the 60 Chateaus on the list, each one was a party; with live music playing, people dancing, food and wine flowing, it made it hard to leave and move on to the next. I must be honest with you. While the wine was certainly flowing at every winery, I did hold off from drinking until later on in the run, as I was trying to reserve my energy for the many kilometres I had ahead of me. It was around the 37km point I had my first wine. While I was unsure of the variety it was, I do know it was a white wine, and boy was it delicious! Along side the road there was also freshly shucked oysters (the last thing I could think about eating on a marathon), along with delicious succulent steak and even ice cream as we neared the finish line. Yum! As the finish line drew closer, whether it was the wine or the ice cream, my energy levels picked up. Making a bolt to the end we were greeted with our finishers’ prize of a backpack, a t-shirt, a cup, a medal, and the all-important bottle of authentic Bordeaux wine, complete with a single rose. So fancy, but oh so French. After finally completing my first marathon, the party did not end there. Right along side the track was the after-party tent. Inside the tent, the wine continued to flow with the DJ spinning pumping tunes, dancing all around and Chewbacca out the back lapping it all up. It was the best recovery anyone could ask for. Looking back at this epic run I endured, it was something like no other. Never before have I completed a run where I was literally smiling the whole way. Unbelievable. It will be something I will look back at fondly, and would highly recommend anyone and everyone to take part in it. You will have no regrets, just a greater love of French wine. For those of you playing at home, click here for a map and list of the Chateau’s we visited. 60 Chateau’s in total! In my last post I mentioned that I’m 30 years of age, or as some would say, 30 years young. My thirties so far have been great. In fact, the way that I decided to enter in to my thirties was somewhat of a different experience most would have. It was back in early 2013 that I decided that I wanted to do something to mark this milestone of a birthday. With Google at my fingertips I was searching for some inspiration on what I could do. It wasn’t until one fine sunny February morning that my fitness freak of a brother emailed me a webpage link, from his home in London, suggesting that I travel over and do a marathon with him. Being a social runner, and having only ever done one half-marathon a couple of years ago, I swore to myself I would never do a full marathon – way too far! So I clicked through on the webpage link, and low-and-behold I was sold. 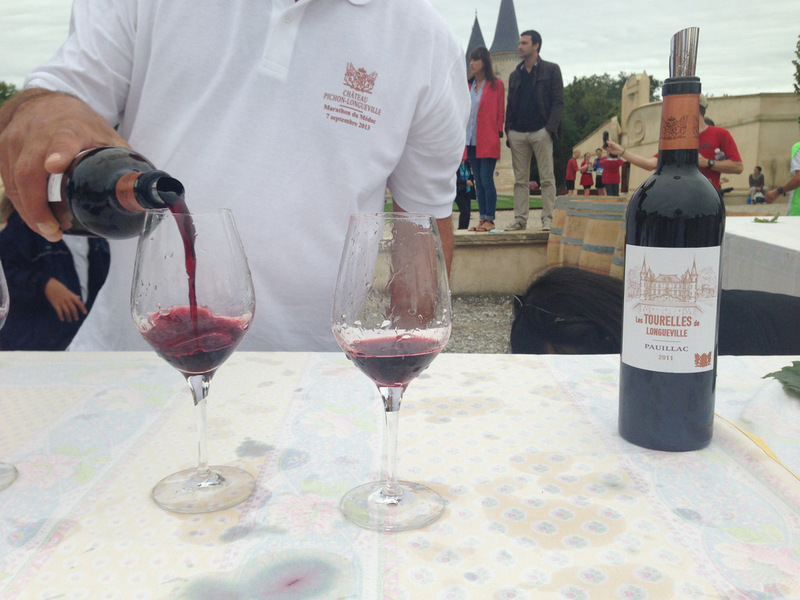 It was a wine marathon in Bordeaux France! 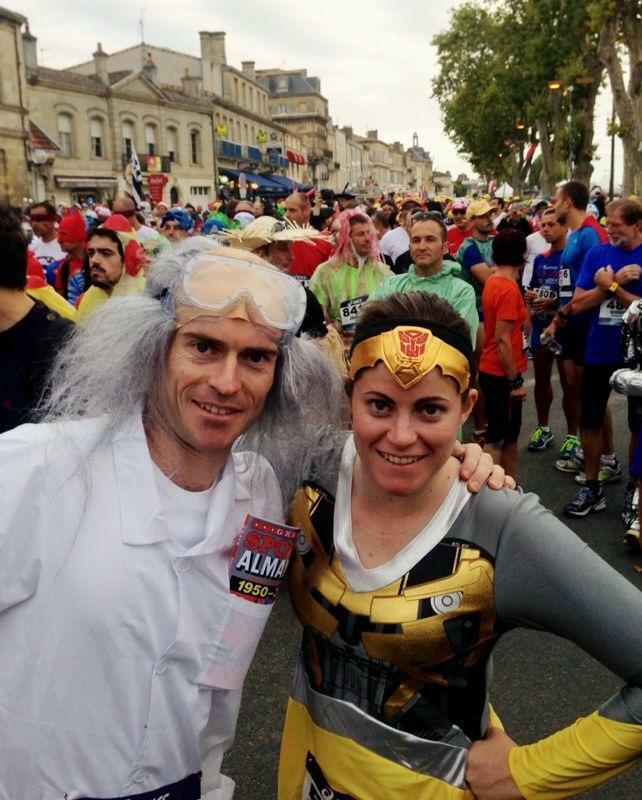 Yep, you read it right…a wine marathon in Bordeaux France. 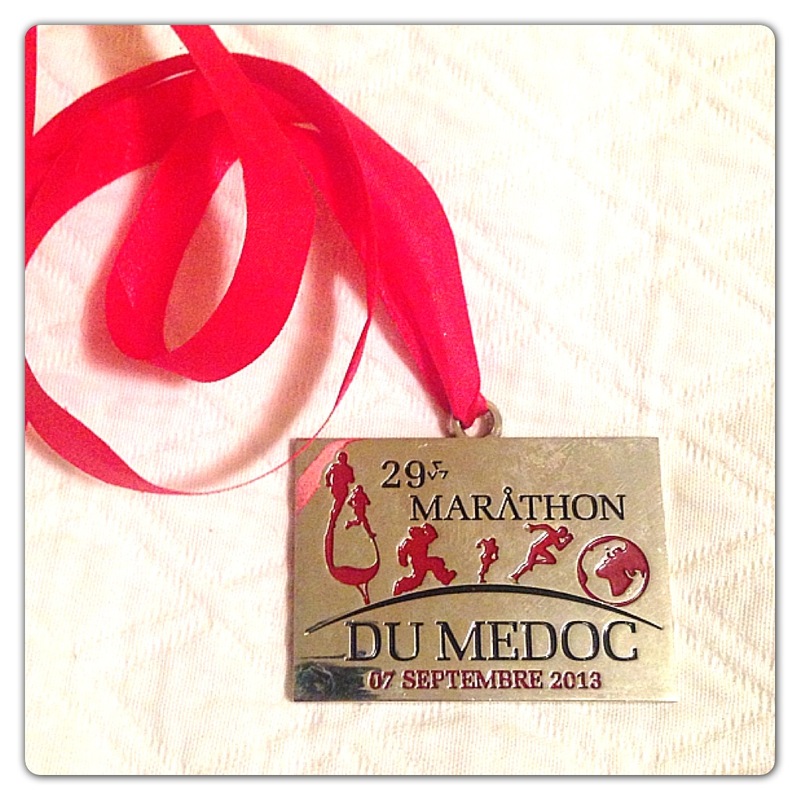 The marathon is called ‘Marathon Du Medoc’. 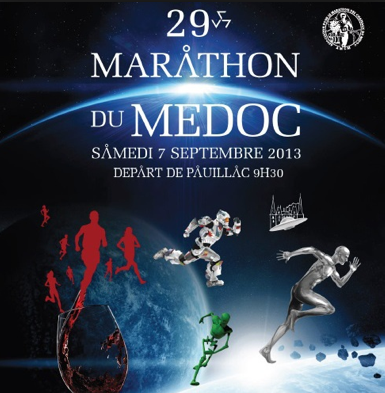 The idea of this marathon, is that you dress-up in fancy dress, with the theme being Science Fiction, and run a full marathon distance of 40.195km (26.2 miles) through the Medoc wine region (think of the Yarra Valley, but bigger and filled with French people), dropping in to chateaus and drinking wine along the way. All signed up, I began my training regime. How does one train for an event like this? Should I be taking a flask of wine on my training runs? 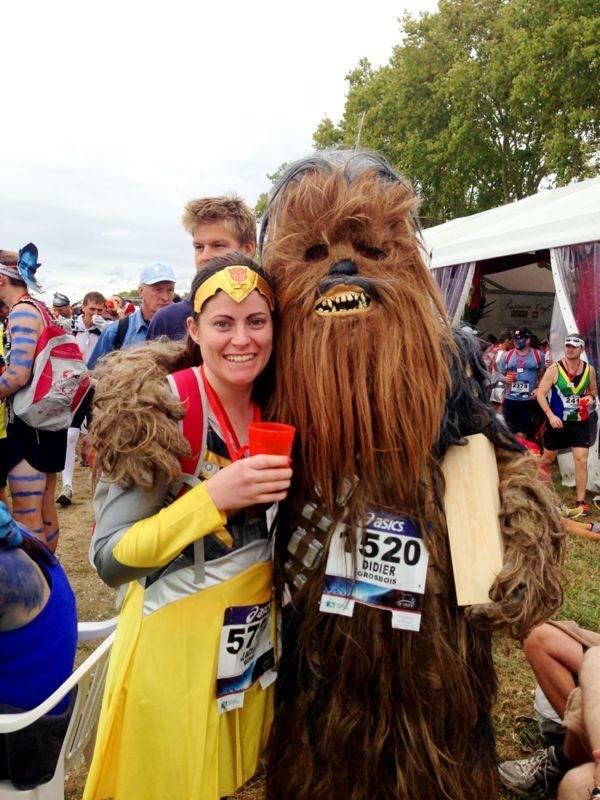 What fancy dress costume should I run my first marathon in? Seeing as though I’d never run that far before, and to avoid the weird looks from people seeing me downing a shiraz on the running trails, I decided to split my training in to two parts. I followed a 13-week program of continual running. Never before have I run so much in my life. It was painful, but at the same time rewarding, running the distances that I did, and churning through a pair of runners from it. Keeping up the vino intake, responsibly of course. While most who train for marathons would eliminate all forms of alcohol, it was important for me to keep this up. After all, I would be drinking wine on the run, and it would be irresponsible of me to lower my tolerance levels. Suffice to say, part two of the training program was my favourite. At the end of the 13 weeks, it was time to pack my bags, along with my fancy dress costume, and head over to France. Stay tuned, as my next post I’ll be taking you along the ride with me on what was a very unique, and extremely exhilarating experience. 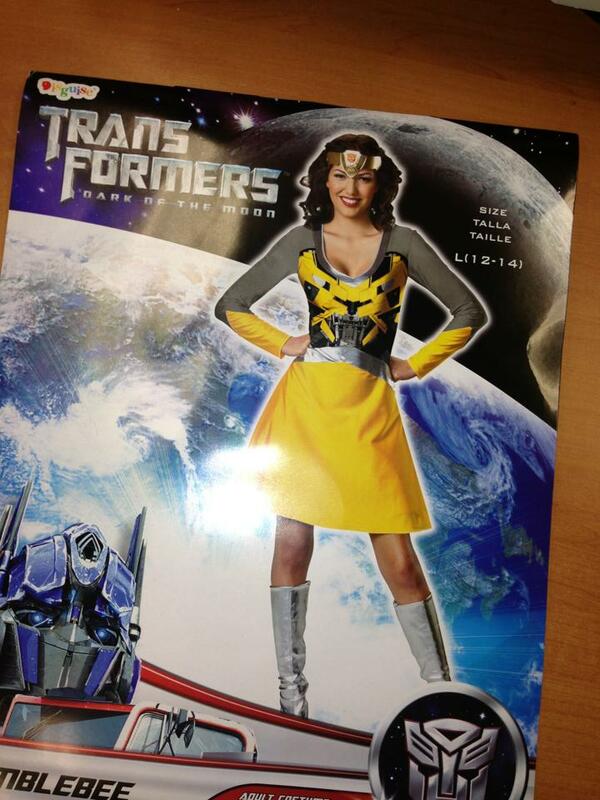 Here’s a little taste as to what I chose as my Sci-Fi fancy dress costume. Until next time wino’s, cheers. Okay, so you’re probably wondering ‘who is Tip the bottle’? ‘Does he or she even have any solid experience in the wine industry’? ‘Should I trust what they say’? ‘Did I leave the oven on’? So to answer your questions, lets kick it off with who am I. My name is Jacinta, and I currently live and work in Melbourne, Australia. I was born and raised in country Victoria, with the great privilege of having the Strathbogie wine region on my back doorstep. I’m 30 years of age. Yep, the big 3-oh! While I’m not yet fully matured, I have been drinking wine for some time now, and have recently had an increased interest in all things wine over the past four to five years. Why only recently you ask? I suppose the turning point was when my foody-friend invited me to come along with her to a wine tasting showcase in Melbourne. Having only ever been a seasoned “I only drink Sauvignon Blanc” wine consumer, attending the wine tasting showcase really opened up my eyes, and filled up my wine glass to trying new and different varieties, some of which I never knew existed! So while I’ve never worked at a winery, nor picked grapes from the vineyard, or squashed them with my feet (which I’d love to try one day), my experience simply comes from sharing a bottle with friends over dinner, going to wine tasting festivals and wineries, and having a drop after a long day at work. Trust me when I say I love wine. Even though we may all have different preferences when it comes to particular types of wine, such as ‘I love a sweet wine’ or ‘I prefer reds over whites’, I can safely say that I love trying and experiencing all types of wines from super sweet to super dry. I must be honest with you though, my taste buds generally love to be treated to a dry wine, particularly a great red! So hopefully I’ve given you a bit of an idea as to who I am, and where I come from, however I can’t answer your question if you left the oven on or not. You will just have to go and check that yourself. Welcome to my blog ‘Tip the bottle‘ where I’ll be blogging all things wine related, which may spill over into other beverages – excuse the pun, but I just couldn’t help myself. ‘Tip the bottle’ is for those of us alike, for when it comes to wine, while we don’t walk the walk and talk the talk of a fancy wine connoisseur, we just love to kick back and enjoy a glass. So please, pull up a chair, tip the bottle, pour yourself a glass, and enjoy in sharing my grape experience. Oh, and feel free to drop me a comment, as I’d love to hear from you.